I blog at Weddingbee as Mrs. Bunting. I am a freelance illustrator and designer with a love for nature and a taste for adventure. Textures and color fuel my world, along with apple cider and noodles. When I'm not running the color department of a digital printshop during the day, I'm spending my free time making art, watching movies, and, oh yeah, planning an event filled with colors, tissue poms, and love (better known as my wedding)! Want to drop me a line? …a graduate of Grand Valley State University in Art & Design. …illustrator and web designer (check out lullafly.com to see her work). …a graduate of Grand Valley State University with a degree in History. …complete computer and video game geek. …secretly a raccoon. maybe. (he does have to wash his hands before and after each meal). 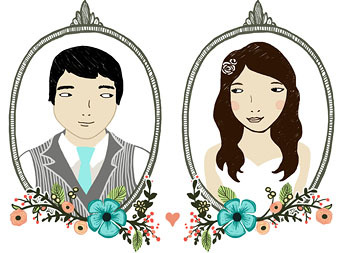 I love the flower garland for your website logo and illustrations of you and your husband-to-be. How did you make these? I am looking for this style for my wedding invitations and I’m trying to find out if anyone makes something like this (that is less costly than Rifle Paper) or if there is a DIY route. © 2019 We Wed. Theme: Ari by Elmastudio. Proudly powered by WordPress.